earth is going nova: This Fish's Tongue is ALIVE! Yes. 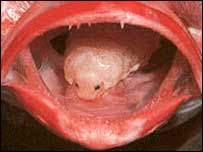 That's a picture of the inside the mouth of a red snapper fish. "A gross creature which gobbles up a fish's tongue and then replaces it with its own body has been found in Britain for the first time. Don't be scared, though, "scientists say the creature does not pose any threat to humans [yet!] and only attaches itself to fish tongues." FOR NOW!